Families come from all over the metro area to visit Pirates Cove. 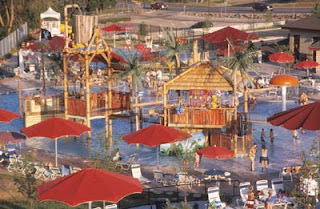 With easy access in a suburban area, Pirates Cove is a great water park for families looking for fun close to home. It is also a much more manageable size (and price) than larger water parks. Opening day is this Saturday, May 29! Residents in both the Englewood and South Suburban Recreation Districts receive discounts for single day admissions and season passes. Through May 31, use the ONLINE COUPON to receive a free admission to The Wildlife Experience when you purchase the Captains Pass (10 visits at a discounted rate) for Pirates Cove. Kids of all ages will love this water park. We took our kids for the first time last year and we had a blast! We waded in the kiddie pool, splashed in the fountains, drifted around the lazy river and even played in the sand yard. Lockers are readily available, food is priced reasonably (it is a theme park, so it's not exactly cheap either), and the park is compact in design (in other words, you can do more swimming and less walking). Is it busy? Oh, yeah. You'll want to come early for the best parking (which is free) and secure your beach chairs for the day. Bring plenty of sunscreen and get ready to play! The best part, like with any outdoor and water related activity, is that your kids will be wiped out after a day at Pirates Cove. And if you're a resident of Englewood or South Suburban, you can probably even make it home before they fall asleep in the car.